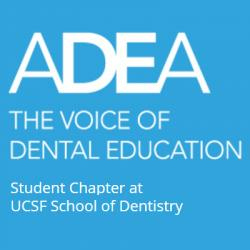 I am Archnaa Rajasekaran, final year international dental student and a proud ADEA-ADCFP fellow. My research project aims to identify how effectively treatment planning is done on AxiUm (electronic health record) by the third and fourth year (including IDPs) students of UCSF during an academic year. I am being calibrated to evaluate the treatment plans prepared by students, which has been a great learning experience. I am Mariam Abadir a fourth year student in International dental program. My research project as a fellow of ADCFP is about international dentists that enter U.S. dental schools with diverse dental experiences. I have created a survey that has been distributed to former students of the international dental programs of both third and forth years of UCSF and UOP. Our goal of this research is to create a common language between educators and students, that is by having a basic base of understanding of international students’ expectations and their level of expertise to maximize their beneficial educational journey at U.S dental Schools. The UCSF School of Dentistry currently uses E-value for D3/4s in their clinical years to provide general praise or critique for faculty members. In this one-sided interaction, faculty members do not have a way to respond or get more information, unless a personal relationship was built to the point where a student felt comfortable enough to provide face-to-face critique to the teacher. Even then, due to the individual nature of such a rare discussion, there remains loss learning/teaching opportunities for other students, and even other faculty members, who were not participants in the discussion. The main goal of this project is to create a teaching tool in which D3/4 students can anonymously report the student perspective, both positive or negative, on specific interactions and incidences with faculty members. Once enough feedback has been received, a PowerPoint presentation will be used to share the cases with a panel of clinical faculty. All discussion or responses from the faculty will be noted, and “clinical teaching pearls” can be generated that can help improve their pedagogical skills. In exploration of a complete dental education experience, the pre-doctoral clinic is a major aspect of student development into future clinicians. Across the country, our students and faculty work together to provide the best care possible while learning procedures, patient management and administrative processing. While the student clinic is a laboratory for learning, it is also a business that produces a product in exchange for compensation from patients and insurers. With this in mind I am working through a retrospective chart audit from the pre-doctoral clinic to evaluate production per chair and number of visits for specific procedures in hopes to develop a further study on improving value and outcomes for the patients and the dental center. Dental schools nationwide are striving to increase student diversity to help better serve our population. Schools have improved in recruiting minority students, but after admission these students’ needs and programs can be forgotten. More attention should be directed into mentorship opportunities for minority students. To do this I will be conducting a qualitative research experiment to understand the experience of underrepresented minorities (URM) at non Historically Black Colleges and Universities (HBCUs) to understand if URM students feel that they receive a sufficient support system after being accepted into dental school. Nitrous oxide (N2O/O2) sedation is commonly used in dentistry to reduce anxiety and dental fears in both pediatric and adult patients. When properly used, it serves as an effective adjunct to local anesthesia. The goal of our project is to survey US dental students on N2O/O2 sedation training curriculum at their respective dental programs. We hope to elucidate how training curriculum differs among dental programs, with the overarching goal of standardizing N2O/O2 sedation training across the US. Throughout the first and second years, UCSF dental students are required to assist as part of their PCC course requirements. However, students often get confused with which procedures they should assist with and how they can assist to the best of their ability, leaving the clinic feeling overwhelmed and perplexed. The goal of our project is to improve the assisting experience by maximizing the learning potential. Our project creates guidelines for dental procedures so that assistants know what to look for and how they can help. These guides will not only serve to streamline the assisting session for the underclassmen, but also ensures that the assistant fully understands the procedure holistically, and yields opportunity for any unclear steps to be elucidated. This project will serve to bridge the gap between pre-clinical and clinical education at UCSF. We are Karisa Yamamoto and Rebecca Lerman, third year dental students at UCSF. Since our first year of dental school, we have been working on our ADCFP Project with our mentors, Dr. Sophia Saeed and Dr. George W. Taylor. The goal of our project is to research the prevalence of depression amongst U.S. dental students and identify associated lifestyle characteristics present in dental school and the broader society. We hope to pinpoint ways we can integrate wellness into the dental school curriculum and learning environment, and provide accessible resources to support students’ mental health and well-being.